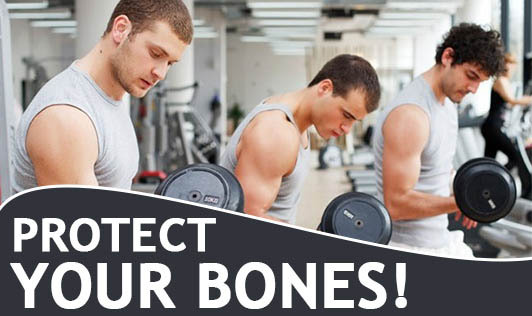 Nearly 1 in 2 women and 1 in 4 men over age 50 will break a bone in their lifetime due to osteoporosis. If bones don't receive what they need to remain strong, gender doesn't matter. Be physically active on most days of the week. Make sure your daily calcium intake is adequate for your age. Get enough vitamin D. Your body is efficient in making vitamin D when exposed to sunlight. Aim for 2 sessions (at least an hour apart) of 10-15 minutes in the open sun daily. Engage in regular weight-bearing exercises, where your bones and muscles work against gravity. This includes walking, jogging, racquet sports, stair climbing, team sports, weight lifting, and using resistance machines. A doctor should evaluate the exercise program of anyone already diagnosed with osteoporosis to determine if twisting motions and impact activities such as those in golf, tennis, or basketball need to be curtailed. Milk and other dairy products like curd, buttermilk contain calcium. Calcium can also be found in dark green leafy vegetables, ragi/ nachni and in dried beans/ pulses and legumes. You can also buy calcium fortified, ready-to-eat breakfast cereal, orange juice, or soymilk.